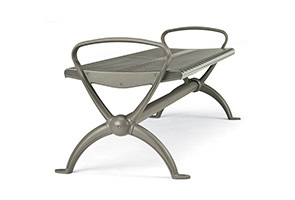 Improve facilities aesthetics and seating area comfort by introducing benches from the Park Lane Collection. This modern take on a classic bench design is constructed of a slatted steel seat assembly with cast iron frame and eye-catching armrests. The entire bench is finished in a UV-stabilized, high performance powder-coating to ensure lasting service in high-volume areas with all-weather conditions. Comes standard with pre-drilled holes for easy surface mounting and stainless steel hardware.